Thoughtspot, the business analytics startup with a founding team comprised of ex-Nutanix, Google and Yahoo folks, has raised $30 million in a Series B round, bringing the company’s total to $40.7 million. The company is targeting the business intelligence market to provide a “Google-like experience” in regards to database analytics and will use the money to build out its sales and marketing staff. Thoughtspot offers a hardware appliance that comes loaded with software that can connect to a company’s existing data infrastructure — as well as services like Hadoop — from which it can provide users with search capabilities that will supposedly save the time it takes for employees to gather the data they want, said Thoughtspot co-founder and CEO Ajeet Singh. The key to Thoughtspot’s product resides in a homegrown in-memory database and a company-built search engine designed to do computations and search for numbers instead of documents. 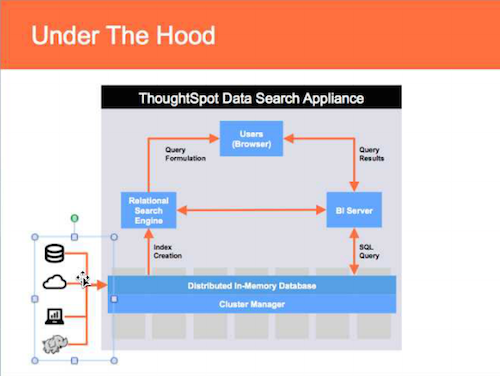 Once the Thoughtspot appliance is connected to an organization’s data framework, the data deemed important by a company can be stored in Thoughtspot’s in-memory database, where it is then indexed so that the search engine can access it. When a user types in an inquiry into the search engine, the company’s business intelligence (BI) server translates it into SQL code that feeds it back to the search engine where the correct information can be retrieved for the user. The company is not alone in the crowded data analytics market, with titans like SAP and Oracle offering similar services and newcomers like Tableau and QlikView doing their own take on data visualization. Thoughtspot’s product is not being sold to the general public as of yet, but the company plans on making it available before the end of the year as it attempts to court medium and large enterprises. Khosla Ventures drove the funding round along with Lightspeed Venture Partners and Box co-founder and CEO Aaron Levie. Keith Rabois, a Kosla Ventures partner, is joining Thoughtspot’s board of directors. Before forming Thoughtspot along with Singh, co-founders Amit Prakash and Shashank Gupta held senior positions at Google and Amazon. The company is based in Redwood City, California, and has 25 employees. Post and thumbnail images courtesy of Shutterstock user Gil C.